Over the past decades, the idea of anthropogenic global warming grew and was perpetuated for many reasons. Misinterpreting the data, politics, and the prospect of making tons of money trading 'carbon credits' collectively propelled the idea of manmade global warming. The link between human activity and climate change got a big boost when scientists found an association between the historical warm periods of Earth and higher levels of CO2. The resulting theories were plausible for several reasons. For the past century we have seen a small rise in the Earth's global mean temperature and a parallel increase in the amount of CO2 in the atmosphere. The logical conclusion was that CO2 must have been the cause of the Earth's warming periods, given that CO2 is a minor greenhouse gas and that the use of fossil fuels has increased dramatically. But there is the other side to the coin. We have been so immersed with the 'dangers CO2 and global warming' that we are failing to prepare for what will be a different outcome from what we expect to happen. The alarmists of man-made global warming foretell of rising sea levels and desertification of our arable land. Drastic outcomes driven by the conviction that man is destroying this planet with his use of fossil fuels. Their scenario also includes ocean acidification, loss of habitat for coral reefs, and starving polar bears. The believers in the man created global warming scenario think that only drastic changes in our use of fossil fuels can save us from this outcome. The environmentalists have embraced the CO2 created warming theory and have promoted it ad-nausea to the public. All of us rely upon what we are told by those who are supposed to know what they are talking about. But most people are unaware of the politics and money behind the scenes that can pressure scientists into promoting biased explanations. The CO2 analogy was a gift to those searching for answers. The CO2 analogy became the low hanging fruit that provided researchers with operating funds. It was simple, made sense, and is potentially a giant money maker for those wanting to broker 'carbon credits'. For those of you not familiar with the CO2 cycle, here is the short version. --- Most of the atmospheric CO2 comes from the oceans. The rest from land sources like decaying plants and animals and the use of organic material for fuel. Atmospheric CO2 is reclaimed by the polar oceans and growing plants. But polar oceans and vegetation have not been able to recapture all of the emitted CO2 in the recent decades. The CO2 that is not reclaimed, stays in the atmosphere and gives us the increases that we are now experiencing. Atmospheric CO2 has been slowly increasing throughout the 20th century. Just since 1958 the atmospheric CO2 has increased by 25%. (315 ppm in March of 1958 vs. 394 ppm Dec 2012 See the CO2 Charts Here That increase is a lot more than can be explained by our use of fossil fuels, so what happened? This record does not go back to the horse and buggy days where CO2 discharges from human activity were modest. No, this record starts at a very busy industrial time not much different from the present day... Which brings us to the question of why is that CO2 level inching up? What is the driver for the climate change we are experiencing and what can we look forward to in the years to come. 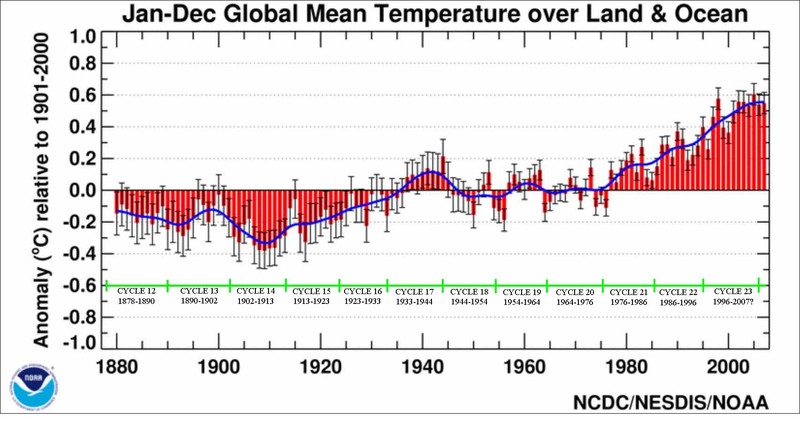 The following graph is of the global temperature oscillations for the past century. Please note the different solar cycles associated with the temperature chart. Cycle 21: (1976 -1986) Back with a vengeance after brief respite. Cycles 22 and 23: (1986 - 2007) Cycle 23 Starting to show a decline in Activity. 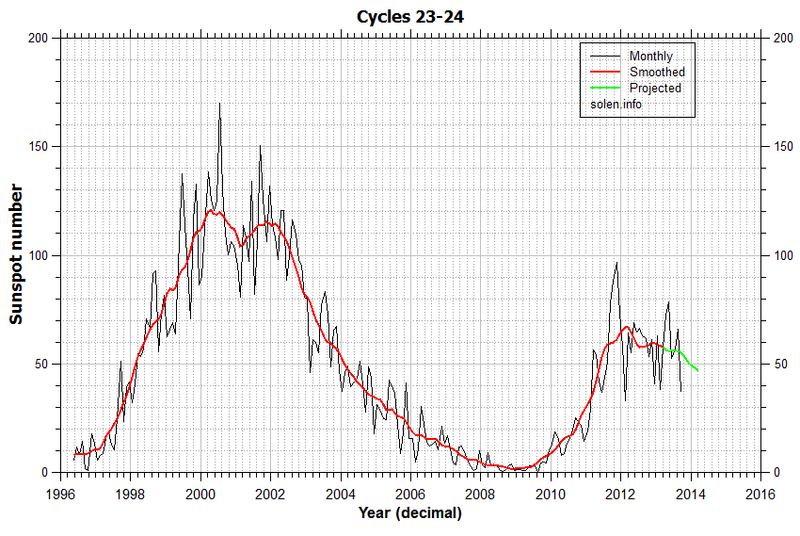 Cycle 24: At the present, we are just past mid-period of solar cycle 24. The following graph demonstrates the gradual decline in solar activity for cycle 23 and cycle 24. Solar cycle 24 is much subdued when compared to previous cycles and may represent a trend for future cycles. Cycles 23 and 24: (1996 - 2013) Cycle 24 showing much subdued solar activity. Solar Radiation: For the past century the Sun has been unrelenting. But these charts only tell of sunspot activity, and I am often asked, "How do these sunspots affect Earth's climate?" Simply put, the higher the sunspot activity, the higher the radiation levels of the Sun. During the maximums of the solar cycle, the radiation levels we receive on Earth can triple, and sometimes more. The following examples will illustrate this point. The following charts also give the flux received on Earth from the maximum periods in 1956 and low count of 2008. Please note the solar flux which is represented by the black line. 1956 solar flux levels for Nov. and Dec. Radiation Comparison: For a comparison of flux (or radiation) received on Earth, this last chart is during the solar minimum period of 2008. I included these graphs to give you a perspective on the high levels of radiation we have been receiving from the Sun over the last century caused by the large number of Sunspots. One more thing, the red line on these last graphs represents the sunspot count for those brief periods and is the true count and not the smoothed averages like preceding solar cycle graphs. 2008 solar flux levels for May-June. In Conclusion: You will note at this time that the Sun output has been in decline over the last four cycles. A lower solar output translates into less solar radiation absorbed by the Earth's oceans. Yes, it is the world’s oceans that have been absorbing most of the increased energy from the Sun. The world’s oceans make up about two thirds of the planet surface. Warmer oceans have meant a large uptick in the volume of CO2 emitted into the atmosphere. But it took several decades for the oceans to get to the state they are in at the present. At this time, it should be stressed that we are better off because of the positive actions to clean the air. Setting the global warming issue aside, we know what air pollution does to our health, and the smog we create by being careless with what we discharge into the air. It has been because of the global warming hysteria that internationally, there are real concerted efforts to reign in air pollution. Over the past decade, we have gained a new appreciation for trees and what they contribute to cleaning our air. We also became aware that we should clean up our own acts of pollution and have added new regulations with strengthened penalties to enforce clean air standards. More trees and vegetation are being planted to overcome our propensity for using large tracts of property for concrete parking lots. Roads and highways are lined with trees and vegetation to make up for our highway's displacement of plant life. Researchers from our universities as well as from the private sector are searching for a cleaner energy source that is less of a pollutant than fossil fuels. All of these changes collectively are good and would not have happened without the concerns raised about climate change. 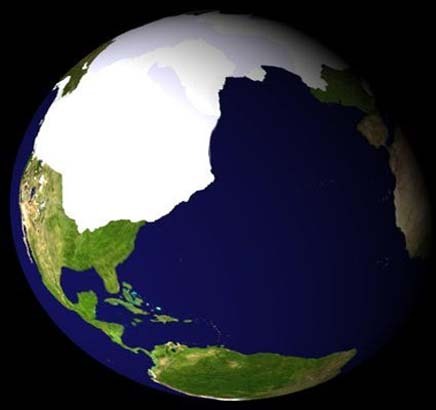 Ice Age Looming? No, but if the Sun’s activity continues with its low radiation levels, we will certainly start seeing cooler oceans. Cooler oceans will be indicated by a decrease in the annual CO2 increases. Once the CO2 levels are no longer increasing, and if the solar activity remains low, we stand a good chance of seeing those levels start to decrease. A future ice-age is possible if radiation continues at a low level and reductions in CO2 decrease to a point that CO2 no longer poses a warming threat. (Remember, CO2 is a greenhouse gas.) The mean temperature of Earth is driven by the Sun. The equation is simple, more Sun, more heat; less Sun, less heat. One last thought – Do not throw away your parkas, long-Johns, and home heaters – there is a change coming! Solar Terrestrial Activity Report has many current and historical graphs related to solar observation. You may want to visit there if you want to do your own research. Daily, they report on the activity of the Sun and detail the conditions of each and every spot, the coronal holes and coronal mass ejections. In addition they monitor and record the radiation levels received here on Earth. A really worthwhile place to learn about our star. Email Robert editor@robfg.com -Robert- Robert welcomes your comment to this or any other of my commentaries.